Interview with Tania Johannisson - Head of Game Integrity and Risk. Tania Johannisson explains her department’s role in maintaining the integrity of the Live Casino games produced by Evolution Gaming. I’m a lover of live casino games. They are my game of choice and if I can’t play at a land based casino my next best option is to play online with a live dealer. Like a lot of regular players I shy away from playing simulated games against a computer. I just don’t like playing something that uses Random Number Generator (RNG) technologies to determine the sequence of cards dealt or the outcome of wheels spun. If something happens I prefer to see it in real time right in front of me. I find it enjoyable and I can (almost!) accept the bad beats when they happen if I can see what’s going on. It’s not surprising though that with the growth in popularity of live casino games comes an increase in complaints about the fairness of the games presented online. You only have to visit some of the player forums to find a few disgruntled players bemoaning the fact that they’ve lost. They honestly believe the games are fixed or the casinos & suppliers are cheating them when they lose. I’ve yet to see any evidence to support any of the claims. However, it did get me thinking about what type of controls are in place. There must be something to protect the player and also the casinos from cheats and cheating. So I decided to find out a bit more. While in Costa Rica, the owner of Visionary iGaming explained what they did. You can read more in my trip report. 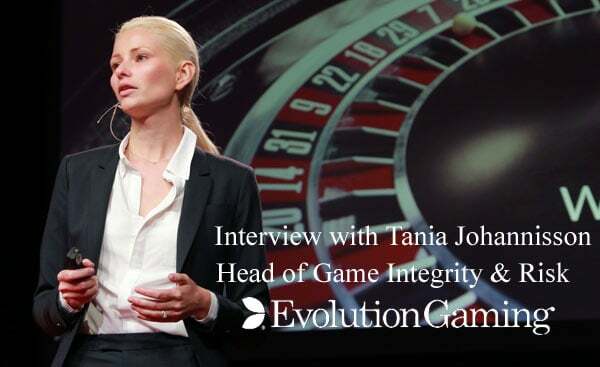 Then during my recent trip to Evolution Gaming I was invited me to speak with their Head of Game Integrity and Risk, Tania Johannisson. We finally managed to speak a few weeks ago, so here’s the transcript of the interview. Hi Tania, It’s great to meet you. Could you tell me a little about yourself and your role at Evolution? Hi Neil, yes, I’ve been with the company for almost a decade. I’ve worked in various positions within Evolution, but for the last 6 years I have dedicated myself to table game protection and building the Risk Management/Game Integrity department. I manage the day to day running of the department, but also strategic development. I have three teams that operate on a 24×7 basis. The Card Quality Team – who are responsible for all aspects of card handling procedures. This includes inspections, quality control and shuffling. The Analytics Team – who analyse game integrity and performance data. The Equipment Team – who manage equipment integrity and its operational performance. The department is now just over 300 people, with a large proportion working in the card quality inspection, control and shuffling section. As well as looking after my team, I spend time on game analysis, testing and driving ideas forward for new game integrity tools. I also monitor that our internal testing procedures on new equipment are being performed correctly. While we only work with the most respected and biggest suppliers, no equipment is used before it passes our internal checks. Is the equipment you use the same as in Land Based Casinos? Yes, all the equipment is the same, including the auto shuffling machines that we use on the single deck games of Casino Hold’em, Ultimate Texas Hold’em, 3 Card Poker and Caribbean Stud Poker. What is the role of the Card Quality team? The Card Quality Team performs a number of card handling procedures that are designed to reduce risk to the game. In general we try to find a balance between the player experience and game protection. In our Blackjack games for example we offer a manual shuffle at the table in full view of the players. The cards are then dealt from a clear Perspex dealing shoe. What sort of data do your teams have access to? The teams have access to real time performance data on in progress games. The analysts use dashboards that we have created to monitor specific aspects of the games and dealers performance. For example we monitor spin speeds or potential bias of the roulette wheels to ensure they operate within defined parameters. When predefined thresholds are triggered one of the team will investigate. Is in game player data available to your Analysts? Game data including bets and historical activities is available to the team after each game has completed. As stipulated by various regulatory bodies, personal player data is not available. That belongs to our licensees. Can you tell me something about your Roulette wheel maintenance? We receive the standard maintenance training from the wheel manufacturers, where we are taught how to clean, level and rotate the wheels. In addition we’ve also developed our own preventative maintenance and monitoring processes. We monitor the wheels in real time, so we can take action as soon as a problem arises rather than finding out about it during the next maintenance window. Do you have this across all your table equipment? We monitor all equipment on a 24×7 basis. Our aim is to ensure the fairness of our equipment at all times. If it breaks we fix it as soon as possible to ensure player satisfaction. Are the controls you have in place for Dual Play Roulette the same as your Studio roulette tables? For Dual play roulette we remotely monitor the equipment. We also have a dedicated person watching over that game and they are the contact for the land based casino. With Dual Play we don’t impose our full online process and procedure on the table. The games are controlled by the land based casino and they deal the game in the same way they deal the rest of their games. We can of course advise and help, but only if requested. What skills are required for jobs within your teams? We look for candidates that have Degrees, specific qualifications and the correct attitude. Some roles need specific skills like statistical analysis or engineering experience. Our roles have a unique skill set; we find that someone with the correct attitude can be trained quite quickly. We are proud of the knowledge we have developed in these areas and we have been externally recognised as leading in the field of risk in the igaming industry. Does Evolution have any sort of relationships with Players? Evolution is a business to business operation. As such we have no direct access or relationship with players. The players belong to the casinos and they maintain all relationships with their players. Are there any external 3rd parties monitoring what Evolution does? All of the processes we have built for game protection and integrity are approved by Audit bodies. I meet with the external Auditors when they come on site and provide them with access to our process and procedures. Audits occur at different frequencies and times dependant on the licensing body. Each body has their own specific requirements. Our Compliance department handles the relationships with all the licensing authorities. Because of the markets we cover, I would say that we are probably the most heavily regulated and audited casino out there. What is your approach to handling Advantage players? In general we have built a secure playing environment for our players and licensees. We are not afraid of advantage players because our games do not offer any advantage that can be exploited. Our main goal is to build an environment that will be safe for any player. What do you mean by “Do Not Offer any Advantage”? For example, our card handling procedures reduce the risk in Card Based games. In wheel based games our monitoring is such that if the wheel is performing outside of defined parameters we know and can do something about it. Therefore there is nothing to be exploited by potential “Advantage Players”. What happens if you detect abnormal betting strategies that may indicate collusion and advantage play? Our Risk Analysts will perform an in-depth investigation, compile a risk assessment report and inform the relevant Operator about the detected activity. I’ve recently returned from Las Vegas and found that a game I played last year has been changed so much that it feels like the player can never win. I’m wondering how games and game rules are created at Evolution? Unlike in land based casinos where the different departments work separately, Evolution has a unique approach when designing games. Product and Risk work closely together. We want to provide the best product for the player in a safe and controlled environment. We always try to produce a great and entertaining game and at the same time allow the player to feel safe. In general, our games have a much higher RTP than most other game providers especially slots providers. Do you think Land Based Casinos could learn something from online live casino suppliers? Absolutely, I spoke at the World Game Protection Conference in Las Vegas last year. I presented on the methods of protecting the integrity of table games by the means of automated surveillance for an audience of around 500 people. We have data and use it to our advantage, which is the main difference in the risk management approaches. In land based casinos they can see players and how they act. In online we can only “see” through the data that is collected. Very are very proud of the products that we have to offer. We get very positive feedback; we have developed the most secure product for our licensees and players. How does Evolution handle player complaints? A player can raise a complaint through their online casino or directly with us through the chat facility at the tables. If the issue cannot be resolved at the table it is passed to the Customer Support team who will involve all the necessary departments to help investigate and resolve the issue. Can you give me some examples of Integrity Controls that you have developed? With any new feature or game, we perform an assessment of the integrity controls that will be needed to ensure the fairness of the game. For example with Dream Catcher, in addition to the maintenance activities recommended by the manufacturer, we designed our own real-time monitoring of the wheel to maintain its operational integrity 24/7. Double Ball Roulette followed our normal Roulette monitoring processes, but we had to design some new processes to support the function of the Double Ball firing mechanism. Can you tell me about what controls you have in place for the Roulette Balls? All of our Roulette Balls are purchased from the same manufacturer. We of course check that the purchased roulette balls are legit. We perform a number of specific checks during the game when we exchange the balls and also during maintenance windows. Thank you Tania for such an interesting look inside Game Integrity and Risk at Evolution. I certainly learnt a lot about what it takes to keep the games we play fair and operational. Finally, is there anything else you’d like to add or say? I hope all players and your readers feel welcome and secure when playing with us. We are the Live Casino provider of choice for a lot of Operators. The game integrity aspect of what Evolution provides plays a very important part in the decision making process for the operators. We work a lot on the transparency of our procedures and we welcome external visitors into our operations simply because we are proud of what we do. I’d agree, as that has been my experience when visiting Evolutions Malta and Riga Studios. In my experience of having visited and talked with all of the live casino suppliers over the past few years, I’ve seen that Risk is a common issue they all have to manage. Evolutions processes and procedures are very sophisticated with a high level of automation. I’ve seen other suppliers achieve the same in a more manual way. What’s clear is the desire to provide fair games and be transparent in doing so and I’m encouraged by that. Unfortunately this may not be enough for the few doom mongers out there, but it’s good enough for 99.99% of players. We need to remember that Gambling is Gambling. The outcome of games is random. Random itself can be random and the house edge is there for a reason. Long term the house will win. If you’d like to see Evolution in action then try any of these Evolution Live Casinos. They’re all great places to play. Tania has been associated with online gaming industry for almost a decade, last 6 years were dedicated to table game protection and security. She has developed a tailor-made Anti-Fraud department to cater for an online live dealer casino operation and has been managing the respective unit since 2011, which now comprises more than 300 risk-related employees and is likely to be one of the biggest risk teams in the world. Tania has been a driver for and in charge of designing various security tools to detect abnormal betting strategies that may indicate collusion and advantage play; she is also listed as an inventor for a few patents related to real-time game integrity monitoring. In February, 2016 Tania spoke as an industry expert at the World Game Protection Conference in Las Vegas, where she presented the methods of protecting the integrity of table games by the means of intelligent surveillance, for an audience of around 500 people. In September 2016 Tania hosted an Online Game Protection Conference, where herself together with world-known security experts talked about vulnerabilities that Live Dealer Casinos are exposed to, and what measurements are taken in order to deliver the best user experience and yet a safe gaming environment.